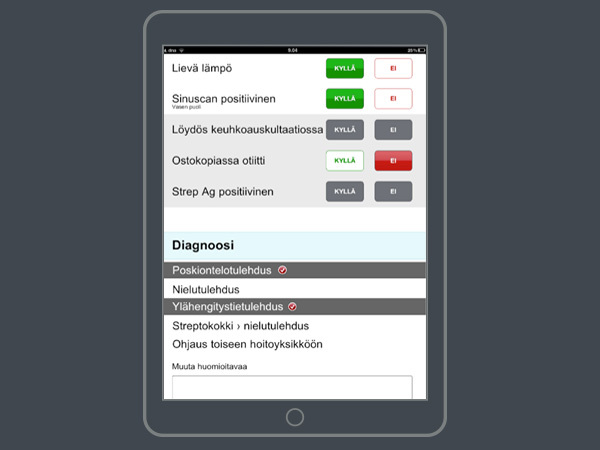 Design of an iPad app for Laastari nurses to better support their work processes. Laastari is a Finnish health care service company that specializes in the treatment of common and acute diseases. Their goal is to offer “simpler and easier access to health care services for busy, modern people”. Laastari clinics are small kiosks located in shopping malls and pharmacies, staffed by a single nurse. An off-location doctor checks the nurse’s diagnosis and prescribes the drugs. When Laastari was starting up, they knew that traditional health care IT could not support their agile way of working. They needed a fast and non-intrusive tool for the nurse to run diagnostics and manage patients. Laastari came to us, and together we quickly realized that an iPad app would be the way to go. In the pressure of time, it can be hard for nurses to focus on the patient. Nurses often experience interference of technical issues in their current IT solutions. Get a patient in and out of the door in 15 minutes. Outclass public and commercial healthcare competition. ● Service design – developing the idea and sketching possible solutions. ● User interviews – gathering the user needs of nurses. ● Creating a concept – considering all the healthcare protocols. ● Prototyping a solution – discussing with all the stakeholders. ● Finalizing and prototyping the concept for implementation by a third party. ● Supporting the implementation process. Our final deliverable is greater than the sum of its parts: Functional prototype of the nurses’ iPad application. We designed an iPad application that contains the essentials of checking-in patients, running diagnostics, and prescribing medication. The application guides nurses through the diagnostic protocol that is based on medical best practices. The diagnostics process was designed in such a way that the nurse can give her full attention to the customer.